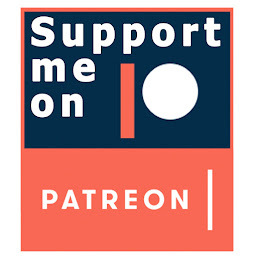 IDICBeer 40k: Fortifications, are they worth it? Fortifications, are they worth it? The first and lowest cost fortification, is the Aegis Defence Line. It is only fifty points for eight pieces of Line, four short and four long sections. The Defence Line is basically a portable barricade that uses the standard barricade characteristics. So, any model in base contact and any models within 2" of them, will gain a 4+ cover save. In addition to this, any unit using the Defence line gains a 2+ cover save if they go to ground and Bikes and Jetbikes assaulting a unit using the Line will have to test for Dangerous terrain. So far, it seems to be the most used fortification that I have seen being played, and I can see why. It's cheap points wise and offers your back field units or weaker units some consistent cover, which could be very useful for those armies that don't get a 3+ armour save as standard. You can also purchase one of three extras for the Defence Line, including two different Skyfire guns, an Icarus Lascannon for thirty five points and a Quad-gun for fifty points. Or if you don't need Skyfire, you can buy a Comms relay for twenty Points, allowing you to re-roll any reserve rolls. Overall, for just fifty points, or no more than one hundred points, the Aegis Defence line can offer a lot to an army, especially if it's lacking in some areas, like good saves, Skyfire bullets or reserve bonuses. 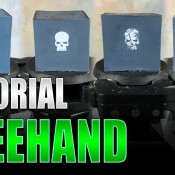 Next is the Skyshield Landing Pad, which is going to set your army back seventy five points. The Skyshield had two landing pad configurations which can be changed once per turn by a model in base contact with it, as long as the enemy doesn't also have a model in base contact. The configurations are Shielded, giving any units on top a 4++ save against shooting attacks, or Unfurled, where deep strikers, jetbikes and jump infantry etc. do not have to take any dangerous terrain tests for landing on in. 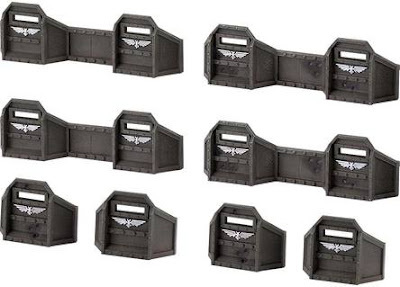 Personally, I can't really see the point of spending the extra points on a Landing Pad over having the Aegis Defence Line, apart from maybe giving your long range backfield shooting units some height advantage. 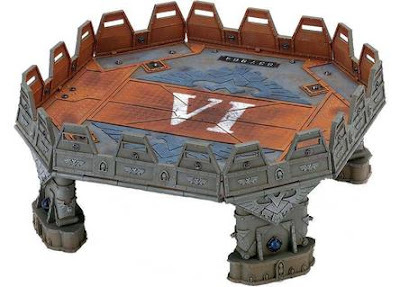 For the same points cost as a Skyshield Pad, you can buy an Imperial Bastion for your army. 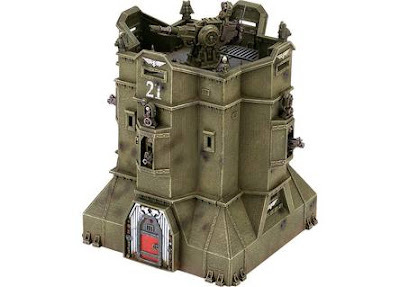 The Bastion is an armour fourteen Building that comes with four different facing Heavy Bolters, as well as some fire points for any units inside to use, plus you can add any one of the same two guns that are available on the Aegis Defence Line. You can also opt for a Comms Relay if you should so desire. The Bastion also has a roof for a unit to bunker in, so Overall, it can bring a lot to an army that need to hold a decent defencive position. 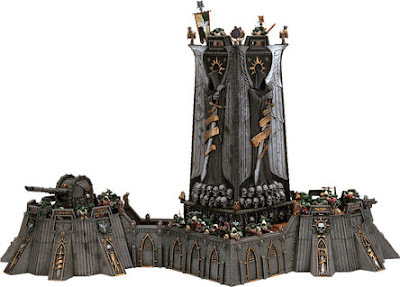 The last Fortification you can buy comes in at a hefty two hundred and twenty points, The Fortress of Redemption is a set of two armour valued fourteen bunkers and a tower all joined together. 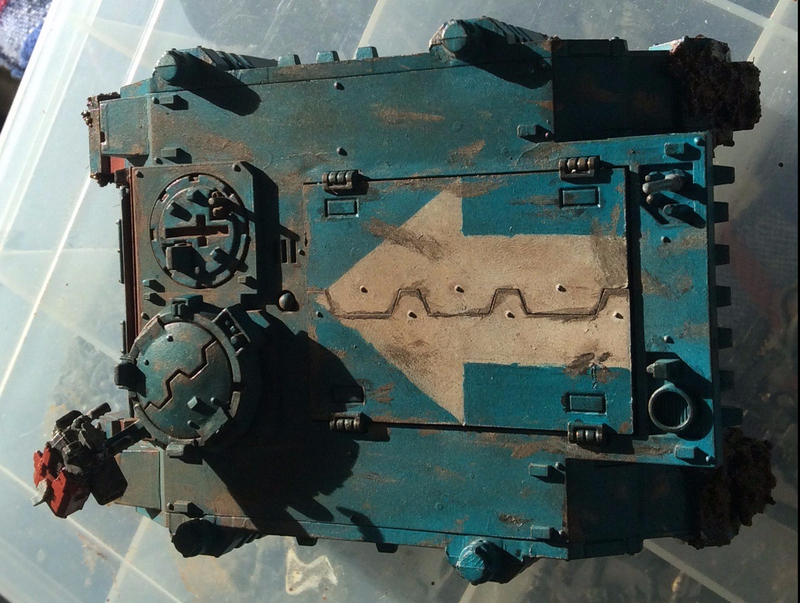 One bunker comes with a Missile Silo and the other has a twin linked Skyfire Icarus Lascannon. You are then able to upgrade the Missile Silo to also have a choice of firing a strength eight Krakstorm Missile instead of shooting the strength four Fragstorm, for thirty points. Ten points will buy you four Heavy Bolters, which does seem like a bargain, but with all the extras this Fortress is going to set you back a total of two hundred and sixty points! The Fortress is expensive, but then again it does offer a big area of defencive barricades, with some nice long range fire power. For me, the best two pieces are the Defence Line and the Bastion. 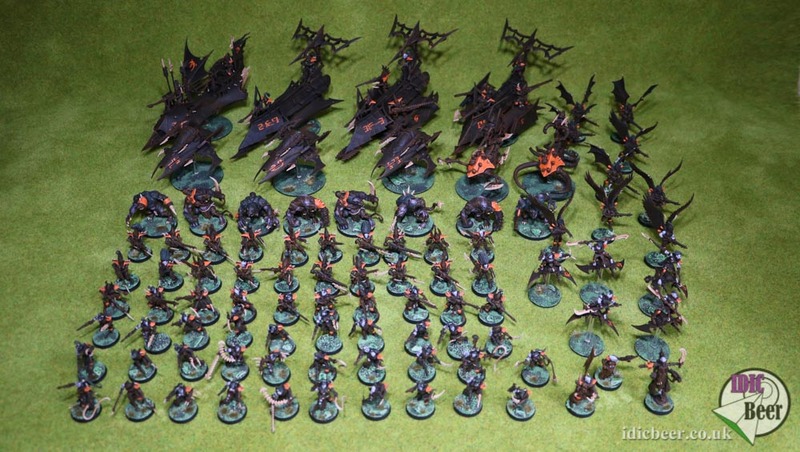 I plan on getting myself a Defence Line at some point, as I think both my Eldar and Nids could make use of it without it being too expensive, points wise. The Bastion is just a bit over the top for me, plus it's not exactly cheap a model to buy, money wise. The Landing pad is interesting, but it seems a bit like something and nothing to me! So what do you make of Fortifications? I'm thinking about using a bastion in my tau army list to hide my markerlight pathfinders in. They always draw a lot of fire so AV 14 protection for them would be much appreciated! In fact I already have a couple made and painted so I dont know what I'm waiting for!